The morning after finding peace with all the infernal rain earlier this week, I received a call from the foreman of the crew refinishing our old house's floors. The torrential deluge and attendant wind had forced their way in, leaving standing water on some of the newly sanded and sealed oak planks. But OK. We have a good team over there, and the other floors are fine and look great. It's just stressful and annoying but it's fixable. I managed to bury my angst in two new, inexpensive kitchen utensil holders from Crate & Barrel. The simple thrill of wooden spoons in one and ladles in whisks in the other was uplifting. And I needed the freed-up drawer space, so these pretties are a win all around. It's lovely to feel settled in to my new kitchen. Today I cleaned the windows until they sparkled, and it really does make all the difference. Jack's best buddy is spending the night tonight (Ol is staying over at one of his closest pal's homes), and I wanted to make a nice dinner for the four of us to enjoy. 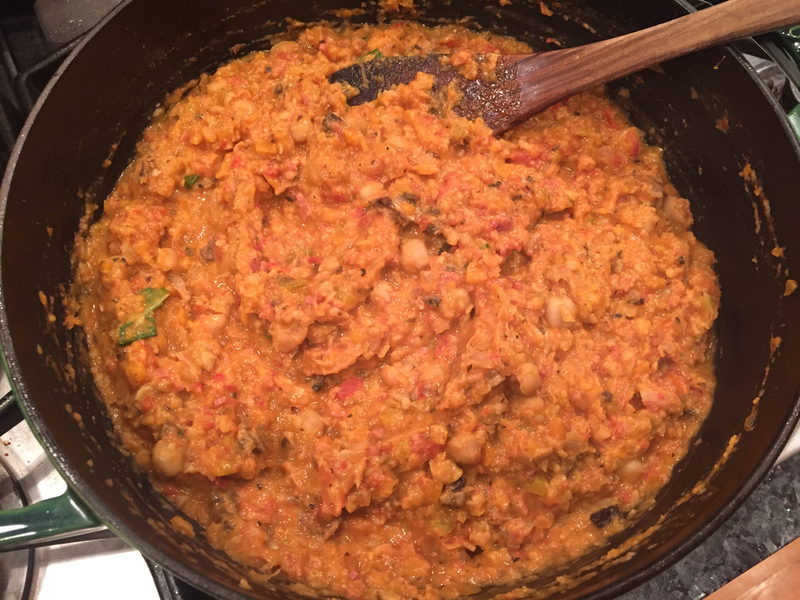 Pasta is always popular with kids but I wanted to push the limits a bit so chose a chickpea bolognese recipe by a foodie acquaintance of mine. It's been on my 'to try' list for a while now, was easy to pull together, and gives you a whole lot of veggies in each serving. The boys were definitely suspicious about it not being your standard bolognese, but they were troopers and ate enough to warrant ice cream. They should have opted for a slice of this lovely cardamom and pear cake I made. Tom and I each had two slices. It's not too sweet and isn't flashy at all. Just solid and comforting and yummy. I love cakes made with sour cream. Perfect way to end a week.